I'm rather embarrassed to admit it, but I just ate at Black Angus, and I liked it. 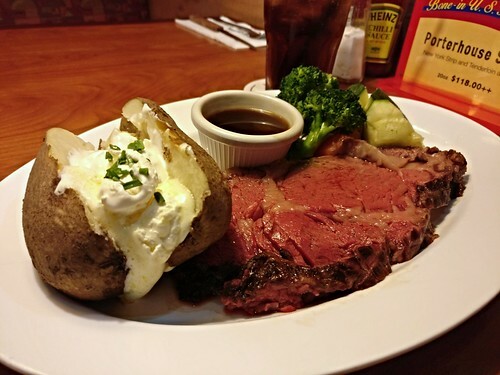 Maybe it was driven by feelings of nostalgia, but somehow the thought of some juicy prime rib complemented with salt, au jus, and horseradish sounded pretty good for lunch, especially since it was sure to be much cheaper than Lawry's. Fortunately, with today being midweek, they had a five ounce lunch special for $26.90 (US$19) that came out in lightning speed. I wolfed this thing down, clearing that entire plate of everything but the carrots. Yes, that meant that I ate the fat and even drank the au jus. Told ya' this was rather embarrassing, yeah?